I travelled to the Azores July 2015 and took advantage of the direct flight from Gatwick to Ponta Delgada. My holiday started the moment I saw the group of islands. My destination was the largest of the islands in the Azores, São Miguel. The landing strip was right by the sea and I could feel the excitement starting to build as we soared over this beautiful island. The great thing about Quinta da Terca is there is an itinerary for everyone. Learn to Ride for people never sat on a horse or for the nervous. Atlantis Trail for people who haven’t been riding long or not as fit and would prefer to do more sightseeing. Green Island Trail for people who have been riding longer and would like to do more riding but still includes sightseeing. If you want to have more free time to yourself with riding and no sight-seeing, there is the Relaxed Ride. The horses are a real credit to Christina who owns Quinta da Terca. Nearly all of them at the centre have come to Christina having not had nice lives in the past. 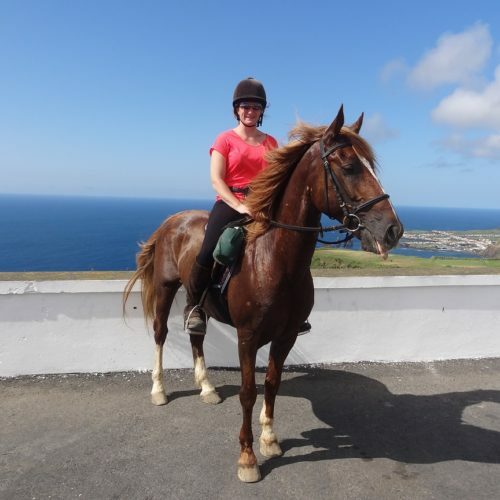 Sao Miguel is a dairy farming island and a lot of farmers still use horses to work the land and transport the milk. Whilst a lot of the horses on the island are well cared for, there are still some that have not been and they seem to end up at Quinta da Terca. I got the feeling these horses know they have been rescued and now have a home for life. They all looked so well and were happy, trusting and seemed to of forgotten their pasts. I cannot mention Christina without saying how great the food is on this ride. You will definitely not go hungry. The food is all handmade by Christina herself. I remember on one full day ride, we were riding in the middle of no-where and then came round the corner to a table fully laid up with a tablecloth on it and a hearty hot lunch. Each day the horses are boxed to a different part of the island. By the end of the week I felt that I had explored nearly the whole island from horseback. I would point out that because the fields have the dairy cows in them, some of the riding is on stony tracks which you will canter on. The horses are used to this but if you visit in the dry months don’t forget your sunglasses (not your best ones either) as it is dusty! When not riding there is a huge array of non-riding activities to do, ranging from a visit to the hot springs, a visit to a warm waterfall at a hot sulphur spring , tea and pineapple plantations and local towns to see the markets and interesting old churches. If the weather is good there is a chance of going whale watching (payable locally). If you get the opportunity do it! If you’d like to read more about my time in the Azores, you can read my blog here.